Jesus was alive on this earth for thirty-eight days after His resurrection. During that time I’m sure hundreds of people saw Him. Here are thirteen of His appearances that are recorded for us in the Bible in chronological order. 1. He appeared to Mary Magdalene as a gardener (Mark 16:9-11; John 20:11-18). How fitting that this woman was chosen as the first to see Jesus. For she was one of the most grateful to Him for what He had done for her—He delivered seven demons out of her; and from that time on she became one of those who stayed close to Him and ministered to Him of her substance (Lu. 8:2). The third day after Jesus’ death, early Sunday morning she and two other women came to the tomb where He was lying to put spices on His body. But they found that the tomb was empty! So Mary and the other women ran to tell the disciples. When Peter and John heard the news they ran to the tomb to see for themselves. Sure enough, the body of Jesus was gone! I’m sure they were confused and wondered what happened to it. They went home. Mary then recognized Him, and she ran and told the other disciples the good news that He was alive! 2. 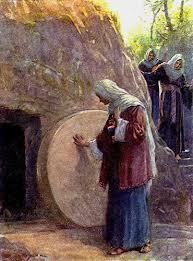 He appeared to the other two women who were with Mary Magdalene—Salome and Mary the mother of James (Matthew 28:9-10). At first all three women were together, but apparently Mary Magdalene broke off from the other two. I suppose she was younger and a faster runner. Anyway, as these two women were going to tell the disciples that the body of Jesus was missing, Jesus suddenly appeared to them and greeted them. Unlike Mary Magdalene, they knew Him right away—I suppose by His usual greeting. They ran to Him, held His feet and worshiped Him! 3. He appeared to Peter (Luke 24:34). We don’t know the details of this appearance, only that when the two on the road to Emmaus came back to Jerusalem the disciples gave them the news that Jesus appeared to Peter. So I am guessing that Peter is the third on the list to see Him. 4. 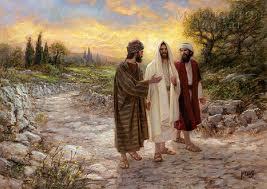 He appeared to two men on the road to Emmaus (Luke 24:13-32). Since Jesus resurrection at sunrise, about four or five hours had passed by when He appeared to two men traveling eastward to the village of Emmaus. We are not told how He appeared to them, but I suppose He just suddenly appeared out of thin air. The scripture doesn’t say that the men were startled, so I suppose they thought He just sort of snuck up on them as they were talking. Anyway, Jesus joined into their conversation, but the men didn’t recognize Him. God kept it from them. They were talking about how sad and disappointed they were in Jesus death and how they thought for sure He was their Messiah. Well, still being unrecognized, Jesus reminded them from the scriptures about how Jesus would have to suffer before entering into His time of glory. And He explained to them from Moses and the prophets about who Jesus was. When they sat down to eat, as soon as Jesus took a loaf of bread and asked God’s blessing on it, suddenly they recognized Him! And at that moment He disappeared! Within the hour they returned to Jerusalem and were happily greeted with the repot that Jesus had risen and appeared to Peter. But they had similar news to tell of their own! 7. 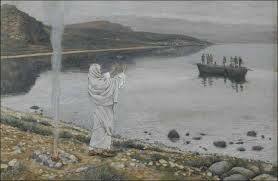 He appeared to seven of His disciples on the shores of the Sea of Galilee (John 21:1-25). 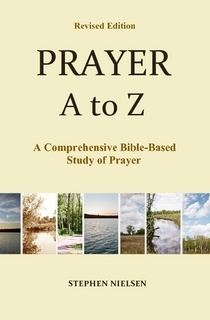 Sometime after Jesus appeared to His disciples in Jerusalem, a few days later Jesus appeared to seven of His disciples beside the Sea of Galilee—Peter, Thomas, Nathaniel, the two sons of Zebedee, and two others. As it happened, they were fishing in a boat not far from shore, and they fished all night without a catch. The next morning Jesus appeared on the shore. They saw Him but they didn’t recognize that it was Him. Well, I think you know the rest of the story. They indeed caught fish—153 of them; big ones! Peter was the first to recognize Jesus, and he was so excited to see Him that he jumped out of the boat and swam to shore to meet Him. There on the shore they all had fish for breakfast. And Jesus was the cook! 8. He appeared to the apostles on a mountain in Galilee (Matthew 28:16-20; Mark 16:15-18). This appearance was not unexpected like the others. It was a pre-arranged meeting, and a very important one. I think it was the meeting that was spoken about by the angels and by Jesus on the very first day of His resurrection (Matt. 28:10); He also told them about this meeting at the last supper (Matt. 26:32). We call the contents of this meeting the Great Commission. There on the mountain, overlooking miles of country, Jesus commissioned them to go out into all nations and make disciples. 9. He appeared to over 500 brethren (1 Corinthians 15:6). Paul tells us that Jesus was seen by Cephas, then by the twelve, then by over 500 brethren at once. Thus it seems logical that this group would have seen Him sometime after the meeting on the mountain with the eleven (I don’t know why Paul refers to the apostles as the twelve, because at this time there were eleven). 10. 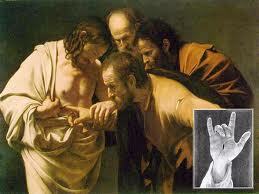 He appeared to His brother James (1 Corinthians 15:7). We don’t know where this appearance was, but if James still lived in Nazareth perhaps it was there. I wonder if Jesus popped in to visit His entire family! 11. He appeared to the apostles and ate a meal with them (Acts 1:3-8; Luke 245:44-49). Acts 1:3 tells us that during the forty days after His crucifixion Jesus appeared to the apostles from time to time to prove to them in many ways that He was alive. 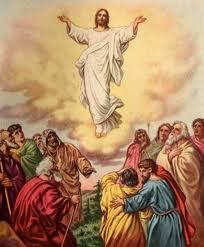 On this particular day—I think it was the very day of His ascension—He was eating a meal with them in Jerusalem. And He opened their minds to understand the scriptures about Him. He told them that after He left He would send to them the Holy Spirit and that they should stay in Jerusalem and wait until He came to them and filled them. 13. He appeared to Paul (1 Corinthians 15:8; Acts 9:1-6; 18:9-10; 23:11). As far as I can understand from the text, Jesus appeared to Paul three different times: 1) On the road to Damascus he saw His presence as a very bright light that temporarily blinded Him, and he heard His voice; 2) he saw Him in a vision; and 3) the night before he was taken to Rome, Jesus stood by him and encouraged him. This entry was posted in 4 Matthew to Acts, Bible Studies, Quiet Time Highlights and tagged Jesus Christ, Jesus' resurrection. Bookmark the permalink. Also, Jesus remained on earth another 40 days because He was not finished speaking of the kingdom of God, a message very important to Him & for us! Well Done!! Love the work! This expression was first used in a book of Greek mythology, “The Bacchae”, written by Euripides in circa 475 BC. The expression occurred in a fictional conversation between the god/man, Dionysus, and the king of Thebes, his persecutor. Very interesting. Maybe Jesus knew that Paul would be familiar with that expression. Euripides?! No, I fix-a dees! Greetings! Thank you for this wonderful study. I am in the process of doing this as well, so this confirmed many things for me. Just would like to mention for point #2 – Luke 24:10 tells us that there was also a woman named Joanna (see Luke 8:2-3 for who she is) who went to the tomb. So, because Matthew’s Gospel says Jesus appeared to “them” (the women), I guessing she saw Him also. Additionally, for point #9, you mentioned that you weren’t sure why Paul mentions 12 disciples when there were only 11 at that time. I believe he is referring to Matthias, who was appointed in the Book of Acts to replace Judas. Remember, they were looking for someone who had been there from the beginning and who also was a witness to the resurrection. They had to choose between Matthias and Justus (Joseph Barsabas). Just my thoughts on the matter. From what I can gather, there are at least 20 people named that saw the risen Christ. The remaining 500 brethren, we can only speculate who they might be. The 20 that I have found would be the 11 disciples + Matthias, Justus Barsabas (see Acts 2:14-32), Mary Magdalene, Mary the mother of James the less, Salome, Joanna, Cleopas (guy on the road to Emmaus), James (1 Cor. 15) and Paul. I’d be interested to know if you came up with any others that are named specifically. I haven’t found any. But naturally, I’m sure that within the 500 brethren would include his mother and siblings, and many of the people who were healed. Anyways – hope you found that encouraging! Thanks again for doing this!